A collection ... of favourite songs and cantatas performed ... at the Theatre Royal in Covent Garden, Vaux-hall and Ranelagh. Cymon and Iphigenia, a cantata. Two English cantatas, for a voice and instruments. 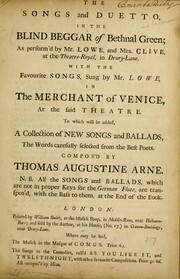 (A 2nd set of) two English cantatas for a voice and instruments ... (Score). Are you sure you want to remove Thomas Augustine Arne from your list?